On land, the UNSC managed to hold their own against the Covenant army. But in space, they had horrible odds of survival. For every one Covenant ship the UNSC killed, they lost three on average. Though not a new technique, the Covenant applied this when fighting the UNSC. Enter Covenant Plasma Bombardment, or Glassing. Employed when the Covenant were finished with looking for things ground side, glassing usually signifies the end of a planets sustainability for life. To glass a planet, First the minor prophet assigned to the ship must perform a ritual. 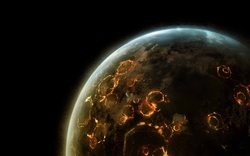 Then the fleet unleashes hell, covering the planet in a criss cross pattern until every inch is uninhabitable.The impact of the plasma bolt is similar to that of a nuclear detonation on a much different scale. When the plasma bolt impacts the surface, the magnetic field sustaining and guiding the plasma collapses, and, depending on how powerful the release of energy is, the initial zone of impact is obliterated instantly. The areas outside of the initial impact zone are affected by the heat wave generated by the blast; depending on the range, those closest outside of the blast zone are instantly killed by the intense heat. As thermal expansion takes over, the resulting flames fan out and create a pyroclastic surge, which will continue to burn the areas it comes into contact with until it has cooled enough that it cannot harm the surface. This process also throws up a large amount of ash and soot, putting the planet into a nuclear winter. Most cases also include the atmosphere of the planet boiling away as well, taking any possibility of it ever recovering as well, though there are exceptions to this, most notably being the planet Reach.